It hardly compares to covering conflict or crisis, but as an inexperienced (to put it mildly) cyclist, I had to swallow my fear of taking on Istanbul's busy, chaotic streets on two wheels when I approached the members of Engelsiz Çorba about coming along on one of their late-night rides delivering soup to the city's homeless. 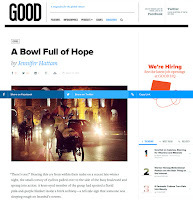 I wrote about the experience from a personal perspective for my blog, and then an article for GOOD magazine about this unusual initiative that aims to make cyclists, the disabled, and the homeless more visible on Istanbul's streets. Read the rest of my article, "A Bowl Full of Hope," on GOOD's website.